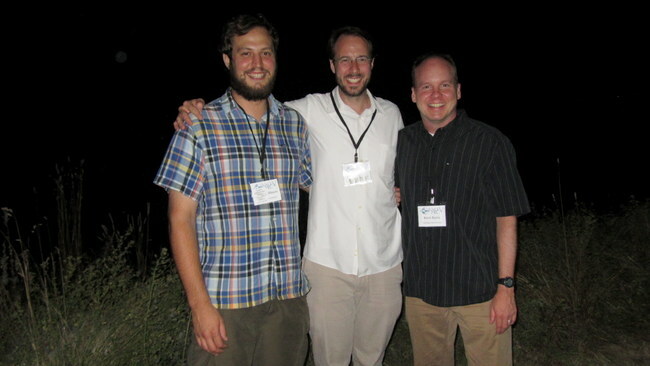 Nick Mason and Kevin Burns recently attended the 5th North American Ornithological Congress in Vancouver. Nick presented his work on evolutionary correlates among vocalizations, habitat, and plumage color in tanagers. This work represents a collaboration between Nick, Kevin, and former Burns lab student Allison Shultz. Nick’s presentation received a student travel award and was a finalist for a presentation award. At the meetings we were also able to connect with former Burns lab student Bill Mauck who now works for the American Museum of Natural History. Bill gave a very nice presentation on phylogeography of the Red-shouldered Hawk. Other highlights of the meeting for us were a symposium on next generation sequencing, in particular a very informative talk on ultraconserved elements by John McCormack from Occidental College. Other favorite talks include Andrés Cuervo’s presentation on comparative phylogeography of Andean birds and Katherine Stryjewski’s presentation on speciation genomics of Lonchura. Overall, these were great meetings with 1500 attendees and many excellent evolution/systematics talks.